A European native spreading from cultivation into disturbed sites, especially forest edges; first collected in 1999 in Lenawee Co. by R. W. Smith. 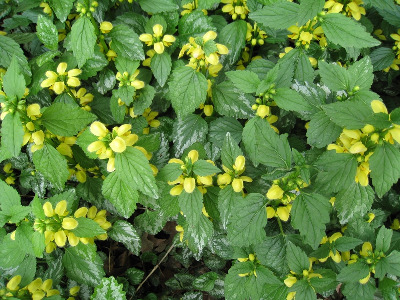 This is a showy plant, frequently cultivated for its conspicuous bright yellow flowers and whitish-mottled leaves. It can carpet the ground quickly by long leafy stolons. The purple-flowered Lamium maculatum also has whitish-mottled leaves, but the white is in a streak along the midrib. Lamiastrum galeobdolon is also a larger plant with the stem pubescence more appressed. MICHIGAN FLORA ONLINE. A. A. Reznicek, E. G. Voss, & B. S. Walters. February 2011. University of Michigan. Web. 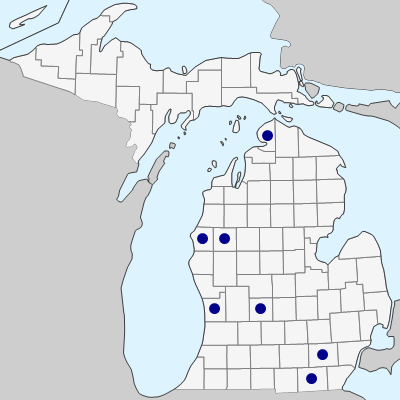 April 19, 2019. https://michiganflora.net/species.aspx?id=1551.